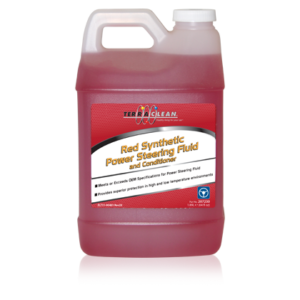 Over time power steering fluid can degrade in a similar manner to motor oil or transmission fluid. As the fluid degrades, it looses its lubricity which can cause metal to metal wear. Dirt present in the fluid can cause damage to expensive components. TerraClean Universal Synthetic Green Power Steering Kits help eliminate these issues. 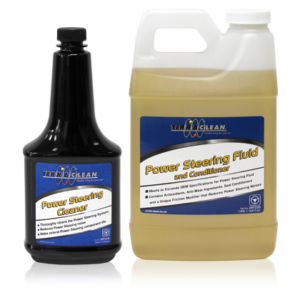 During the power steering service, TerraClean® Power Steering Cleaner cleans components in the power steering system, removing contaminants that can damage expensive parts. 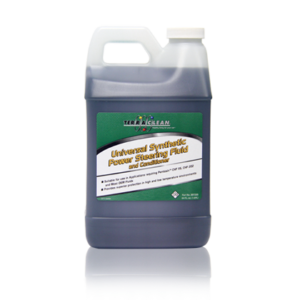 Then TerraClean Universal Power Steering Fluid and Conditioner – Green replaces the old fluid. It is specifically designed to withstand extreme temperatures. It contains a friction modifier to eliminate noise in the power steering system and a seal conditioner to help prevent and eliminate leaks. TerraClean Universal Synthetic Power Steering Fluid & Conditioner – Green is suitable for use with most power steering systems, including European applications requiring Pentosin CHF 11s or CHF 202. 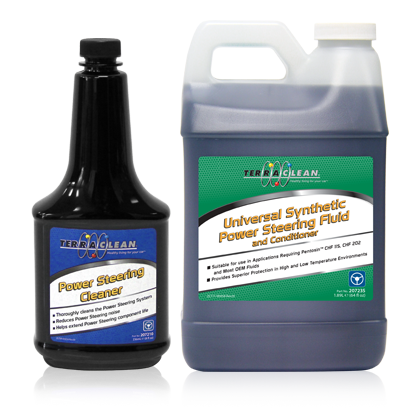 Using a TerraClean® Power Steering Cleaning Kit is an effective method of servicing your customer’s power steering system and helping to maintain proper performance. For Use with the TerraSteer Power Steering Service Machine.